Reports? Who's hunting this weekend? Weather is looking nice!! Surely someone is. We'll be there this weekend. My daughter plays high school basketball and this is pretty much the only weekend she can go. Hopefully it doesn't rain the entire time. Good Luck, Brian! You and your daughter have had some very successful hunts in the past. Thanks Troy! She’s after a particular one, so she’ll need a little luck on her side. Good Luck!! We will be waiting for the pics!!! Awesome news Brian! Looking forward to seeing him. Great timing, it’s going to be a cold and nast week for west Texas. Not the one she was hunting, but still very excited to get this one! Should be a good week with the cold weather coming. The only problem is it's supposed to rain pretty good all week. Awesome! I cannot wait to get my daughter on a good buck. As soon as soccer lets up I'll have her in the stand. Awesome congrats to the hunter!! We had success as well this past weekend. 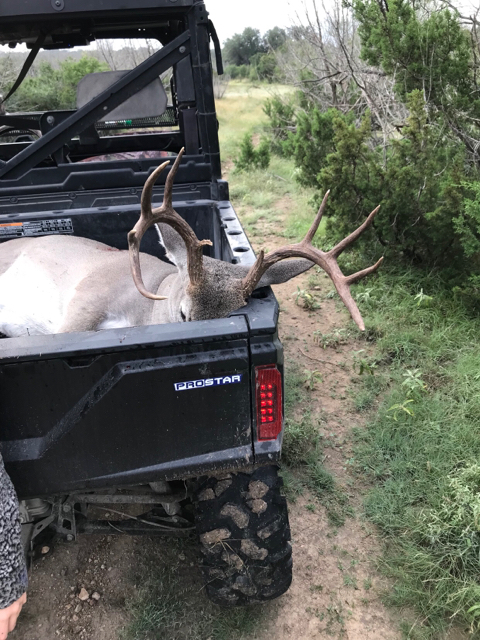 The wife got a great fallow with her rifle and followed it up with her 1st archery buck after connecting with a mainframe 8 mangement buck!! Good luck, you have some good ones on camera! Congrats to her for the kill and you for teaching her! How’s the rain out there today for the local residents on this thread? It has been raining light but steady basically for the last 36hrs. My rain guage has just under 5" in it from Sunday to today. It only holds 5", so I'm gonna have to go out back in a little while and empty it and start over!!! Everything is very waterlogged out here right now!!!! Appreciate the report. FarmLogs says our lease has had 3” since Sunday. I was out there a week ago and it was pretty dang wet then. Hope there’s some reprieve in sight soon. Since early last week, our place has had about 10" of rain. 5 of it this week, like what Bisch has seen. It was extremely soft and hard to get around last week, and the ground was about at saturation capacity. Our ranch manager called us and told us he cant even get out of the ranch its so flooded. We won't be able to get in or get around for at least a week, maybe longer. I’ve got a hunt planned for this weekend. I’m taking my nephew on his first bow hunt. He’s really excited. If it weren’t for that, I’d cancel on account of the weather. Anybody plan on going out this weekend? Leaving in an hour to go play in the mud! Not this weekend but for sure next weekend. Let us know how it looks. I’m heading out Sunday morning. Just noticed on Drive Texas that 189 is closed. I’m not sure if I’ll make it the ranch tonight. I wished I would have looked before I left. Our rancher said we still arent able to get into our place. GOnna be at least another week before we attempt it. Good luck! There was still water on highway 277 in ElDorado as of yesterday. Hope that we can get in Saturday. Usually dries out pretty fast. BrianG how for down 189 are y’all? I’m about 10 miles down on the left. Last month when the town of Sonora flood I was at the ranch. When I left Sunday morning the road closed sign was still up but the roads where good. We made it. No water on the roads but it’s pretty muddy. We’re about 8 miles down on the left. Maybe we’re neighbors. You lease from Dayton? Sounds good thanks for the update. No sir we lease from Whitehead. Knocked a cull down this morning. Cool buck! Nice shot placement too. Good job. Headed up tomorrow morning, who else is going this weekend? We have 3 nice 12pts we have been watching this year. Hopefully they are still hanging around. We are here. Weather is awesome!! Hunted yesterday morning. Weather was great, maybe a little cold as I wasn't prepared. Plenty of targets moving around. Unfortunately I didn't see the 1. 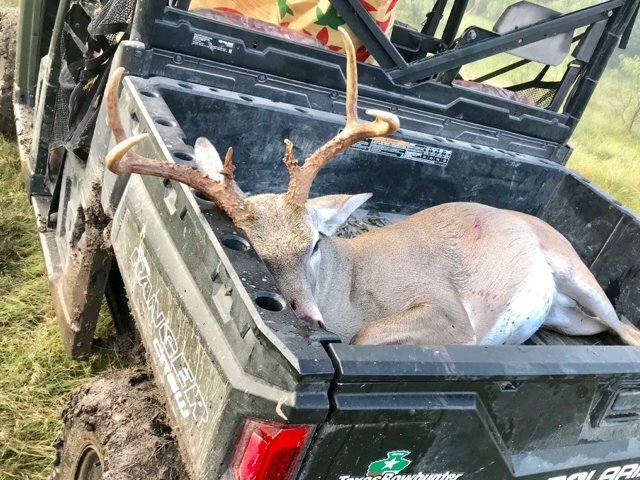 Hunt In: Webb co. Wilson co. Headed down now. We had camera issues last time we were down so I’m excited to see what’s out there. Good luck! I'm still 2-3 weeks out!